Okay, one more Big Sissy creation (actually, there are a lot more, but she's working on an Etsy shop, so I'll let you check those out there). This one is her contribution to Autism Advocacy month. She wanted to use the puzzle design since it's so closely linked to autism in people's consciousness. 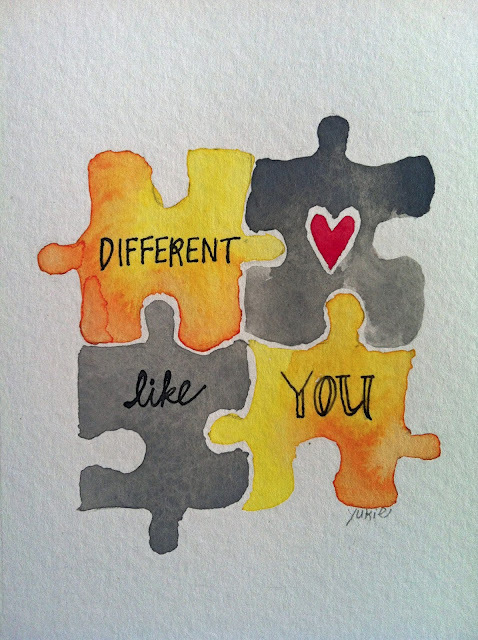 The motto "Different Like You" came from the many conversations we've had at our house about how all of us are made differently. Some of us need glasses. Some of us have bad backs. Some of us have asthma. Some of us can't eat peanuts. Some of us have brains that see the world in unique ways. We're all different, and we're all different in different ways. If nothing else, I hope our experiences with autism teach all of my kids to show compassion and/or understanding for people who don't quite fit in. And, that they learn to advocate not only for themselves but for those around them in need of a voice. The fine print: please feel free to share the image and the motto. but also offer credit where credit is due. And, while you're at it, direct people to this blog and/or Big Sissy's Etsy (once we figure out what to call it). Also, you can see more work by Big Sissy in my blog post "Into the Light." I love this. Yukie is so talented!! Copyright momintwocultures.com. Picture Window theme. Powered by Blogger.